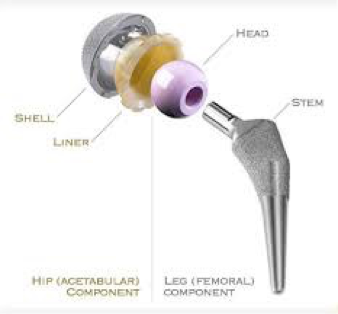 Total Hip Arthroplasty: What is Direct Anterior Approach Hip Replacement Surgery? Total hip arthroplasty is a surgical procedure in which cartilage and bone that were damaged by arthritis are removed from the hip joint and replaced with artificial joint components. This can help relieve hip joint pain from arthritis and restore the normal alignment and function of your hip. In December of 2013, Dr. Stewart transitioned to using the direct anterior approach for hip replacement surgery. He now performs greater than 99% of his hip replacements through this method. The direct anterior approach hip replacement is becoming an increasingly popular method for performing hip replacement surgery due to the numerous benefits it provides. The approach is the method an orthopedic surgeon uses to get to the hip joint for hip replacement surgery. 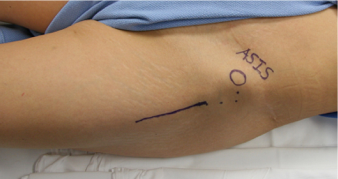 The direct anterior approach is a surgical technique that allows the orthopedic surgeon to access the joint where the hip pain is on the anterior surface, which is diagrammed below. What is Degenerative Joint Disease (DJD)? Degenerative joint diseases (DJDs) are chronic conditions, often resulting in hip pain and the loss of an active lifestyle and quality of life. 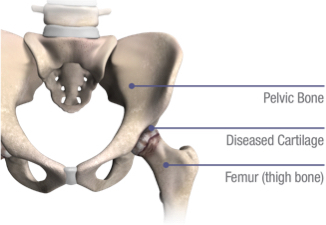 DJDs may result in a person needing hip replacement. Most patients who undergo direct anterior approach hip replacement surgery are able to bear weight as tolerated on the surgical leg immediately after surgery. 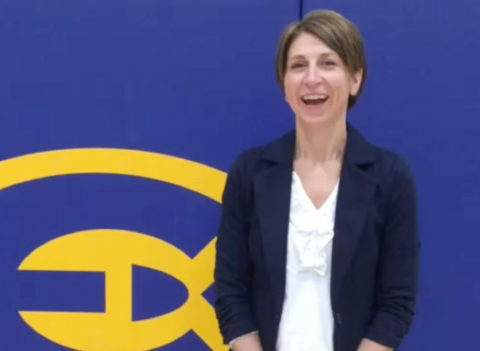 Dr. Stewart may put you on a weight-bearing restriction for a few weeks to reduce your risk of developing a stress fracture, however, this is quite rare. The nursing staff and physical therapists will assist you with walking shortly after hip surgery. Most of our patients use a walker for the first 1-2 weeks and then gradually transition to a cane, and eventually to no-gait aids. Generally, patients who undergo direct anterior hip replacement surgery stay in the hospital one night and then go home the next day. We will arrange for you to undergo outpatient physical therapy 1-2 times per week for the first 3-4 weeks after surgery. We put all of our patients on a blood thinner postoperatively to reduce the risk of developing a blood clot. You will have a postoperative follow-up appointment with Dr. Stewart 10-14 days after your direct anterior approach surgery. 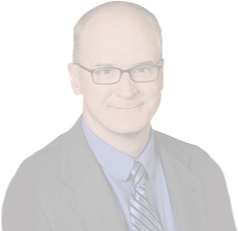 Orthopedic Surgeon, Dr. Stewart, serves patients in the Altoona, Eau Claire, and Chippewa Falls area and is ready to talk with you today. For more detailed postoperative recovery instructions, please see our patient resources page. Read the story of an actual patient that was helped by Dr. Stewart.